Sarvesh Kumar Agrawal, Rani Singh, J.K.Mishra, H.H.Awasthi. Bronchial asthma is one of the most common diseases which has been described elaborately as Tamaka shvasa in Ayurvedic literature. Bhastrika Pranayama, a part of Yoga is a non-pharmacological therapy for the management of Tamaka shvasa. Pranayama works in the patients of Tamaka shvasa by alleviating the aggravated vata, kapha and stimulating the digestive fire. In the present work a comparative study was conducted. The control group was subjected to standard drug therapy and trial group was subjected to Bhastrika Pranayama alongwith standard drug therapy. 60 patients (30 in each group) were selected for the present study. They were followed up three times at the interval of two weeks. Out of 60 patients, 25 patients in control group and 27 patients in trial group were available for the assessment at the end of the treatment. In the evaluation Bhastrika Pranayama shown significant additional effect with standard drug therapy for both subjective (symptoms) and objective (lung functions - FEV1, FVC and PEFR) parameters. No side effect of Pranayama was seen in this study. Thus Pranayama is a safe and effective therapeutic procedure, so it should be considered for the routine treatment in the patients of Tamaka shvasa (bronchial asthma). Key words: Bronchial asthma, Tamaka shvasa, Bhastrika pranayama, Non-pharmacological therapy, Lung functions. Sarvesh Kumar Agrawal, Rani Singh, J.K.Mishra, H.H.Awasthi. ROLE OF PRANAYAMA IN TAMAKA SHVASA (BRONCHIAL ASTHMA). J Res Educ Indian Med . 2009; 15(1): 45-52. Sarvesh Kumar Agrawal, Rani Singh, J.K.Mishra, H.H.Awasthi. ROLE OF PRANAYAMA IN TAMAKA SHVASA (BRONCHIAL ASTHMA). http://www.jreim-ayushjournal.com/?mno=191509 [Access: April 25, 2019]. Sarvesh Kumar Agrawal, Rani Singh, J.K.Mishra, H.H.Awasthi. ROLE OF PRANAYAMA IN TAMAKA SHVASA (BRONCHIAL ASTHMA). J Res Educ Indian Med . (2009), [cited April 25, 2019]; 15(1): 45-52. Sarvesh Kumar Agrawal, Rani Singh, J.K.Mishra, H.H.Awasthi (2009) ROLE OF PRANAYAMA IN TAMAKA SHVASA (BRONCHIAL ASTHMA). J Res Educ Indian Med , 15 (1), 45-52. Sarvesh Kumar Agrawal, Rani Singh, J.K.Mishra, H.H.Awasthi. 2009. ROLE OF PRANAYAMA IN TAMAKA SHVASA (BRONCHIAL ASTHMA). Journal of Research and Education in Indian Medicine (Est.1982), 15 (1), 45-52. Sarvesh Kumar Agrawal, Rani Singh, J.K.Mishra, H.H.Awasthi. "ROLE OF PRANAYAMA IN TAMAKA SHVASA (BRONCHIAL ASTHMA)." Journal of Research and Education in Indian Medicine (Est.1982) 15 (2009), 45-52. Sarvesh Kumar Agrawal, Rani Singh, J.K.Mishra, H.H.Awasthi. "ROLE OF PRANAYAMA IN TAMAKA SHVASA (BRONCHIAL ASTHMA)." 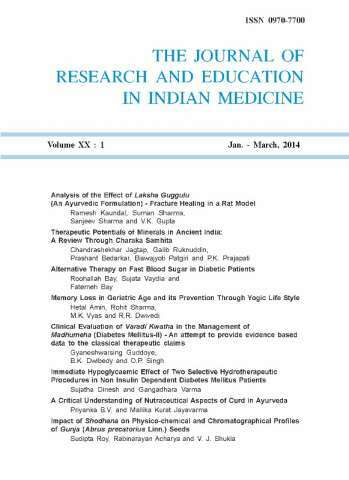 Journal of Research and Education in Indian Medicine (Est.1982) 15.1 (2009), 45-52. Print. Sarvesh Kumar Agrawal, Rani Singh, J.K.Mishra, H.H.Awasthi (2009) ROLE OF PRANAYAMA IN TAMAKA SHVASA (BRONCHIAL ASTHMA). Journal of Research and Education in Indian Medicine (Est.1982), 15 (1), 45-52.